THE PERFECT BATHROOM ACCESSORY FOR ANIMAL- LOVERS! ANIMAL FRIENDS CERAMIC SOAP DISHES ADD AN ADORABLE TOUCH TO ANY BATHROOM AND ADDS FUN BY HAVING THIS BEAUTIFUL CHARACTERS. CHARACTERS ARE: MONCKEY ,FROG ,DUCK, AND DOG, GREAT FOR HOME,DAY CARE CENTERS, CHILDREN'S BATHROOMS AND MORE, ANIMAL FRIENDS CERAMIC SOAP DISHE ARE A MUST TO HAVE IN ANY BATHROOM!! THE PERFECT BATHROOM ACCESSORY FOR ANIMAL- LOVERS! 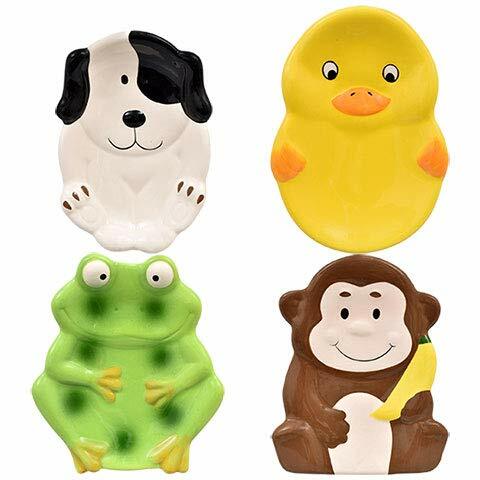 GREAT FOR HOME,DAY CARE CENTERS, CHILDREN'S BATHROOMS AND MORE, ANIMAL FRIENDS CERAMIC SOAP DISHES ARE A MUST TO HAVE IN ANY BATHROOM!! GREAT TO ADD SOME FUN TO YOU BATHROOM!! If you have any questions about this product by Animal Friends, contact us by completing and submitting the form below. If you are looking for a specif part number, please include it with your message.